Amanoi is a luxury, award-winning meditative retreat on the coast of Nui Chua National Park, one of Vietnam’s largest natural conservation sites. Amanoi’s two Spa Houses are the first of their kind in Asia. The Thuy Lien Spa House (meaning Lotus Spa House in Vietnamese) borders one of Amanoi’s tranquil lotus lakes while the An Son Spa House (meaning Peaceful Mountain Spa House in Vietnamese) affords serene vistas of the national park. Both provide guests with completely private spa facilities together with one or two beautifully appointed guest pavilions. Facilities include a double treatment room, a contemporary Hammam or a wooden-clad Banya, a 15m swimming pool, relaxation deck, outdoor dining area, steam room, cold plunge pool and Jacuzzi. Whilst staying in a Spa House, guests will be tended to by two dedicated therapists, and can enjoy a daily Hammam or Banya treatment, a daily 90-minute Aman or Vietnamese massage, breakfast and return airport transfers from Cam Ranh Airport (CXR). Additional treatments can be arranged upon consultation with your private therapists. The airy, serene ambience of Amanoi’s Pavilions, Villas and Residences offers a tranquil counterpoint to their dramatic setting. A contemporary take on traditional Vietnamese architecture, they blend seamlessly with the natural surrounds. From their curving roofs peeping above the treeline to their latticed windows and discreet natural materials, Amanoi’s Pavilions and Villas are at one with their magnificent surroundings - whether ocean or mountain view, all villas come with private decks and infinity pools. 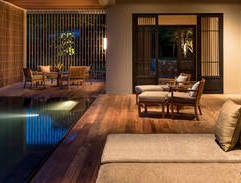 Amanoi’s two Spa Houses are the first of their kind in Asia. The luxury resort features the serene lakeside Thuy Lien Spa House and the equally secluded An Son Spa House providing guests with completely private and comprehensive treatment facilities, including Banya and Hammam. The five-star resort's restaurant is open to guests and non-residents. Vietnamese food is considered one of the healthiest and tastiest cuisines in the world, admired for its fresh ingredients and selective use of herbs and spices. Fresh fish features prominently on Amanoi’s menus, delivered daily directly from local fishing boats, while herbs and vegetables are handpicked from the resort’s organic garden. Begin your day at the Beach Club with Amanoi’s Sparkling Breakfast, then as the stars come out, unmarred by city lights, relax over cocktails in your own open-air cinema at the Clifftop Pool. Inside, soaring columns and sloping rooflines frame sea views that are revealed in their full glory from the terrace. High above the sea, the coast stretches in both directions, with not another building in sight. Fragrant Vietnamese house specialities include braised abalone with shiitake mushrooms, whole live crab fried with tamarind sauce, fresh spring rolls with shrimp and pork, and grilled beef in bamboo. All seasoned with herbs from our very own organic garden. Open throughout the day, the Beach Club is ideal for long lazy lunches and sunset cocktails with panoramic beach and sea views. Larger groups can be accommodated for dinner, or we can arrange a romantic dinner by the beach. Cancellation within 15 days prior to arrival, early departure or no show will incur 2-night room charge penalty plus tax. Full prepayment is required 15 days prior to arrival. Extra bed will be charged at US$180 plus tax, inclusive of breakfast per night. Famed for its cuisine, art and rich history, Vietnam is increasingly gaining recognition for its natural beauty and biodiversity. Nui Chua National Park protects an area of more than 29,000 hectares of pristine coastal and marine habitats in Ninh Thuan Province, northeast of Ho Chi Minh City. It is on the dramatic coastline of this National Park that Amanoi is situated. A short buggy ride down to the shoreline reveals Amanoi's swathe of golden sand – a private beach looking out to the quiet and sheltered waters of Vinh Hy Bay. While the pretty fishing village lies just around the headland, Amanoi's beach enjoys an uninterrupted horizon of blue sea and sky. The closest airport to Amanoi is Cam Ranh (CXR), a scenic 60- to 70-minute drive from the resort. Direct domestic flights are available from Ho Chi Minh City (1 hour), Hanoi (1 hour 45 minutes) and Da Nang (1 hour 25 minutes), while direct international flights are available from Hong Kong, Guangzhou, Seoul, Moscow and Kuala Lumpur.